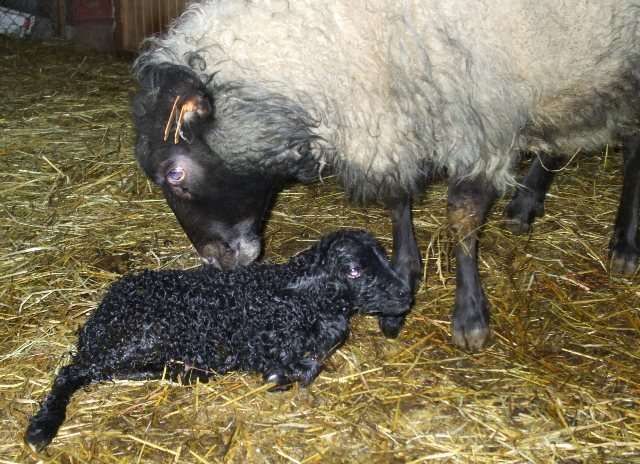 Earlier today, our ewe Enigma (among the first of the lambs ever born to us, back in 2003) delivered two beautiful lambs. Then, when I went out to do the evening chores, I discovered…her daughter, Conundrum, had just done the same! Interestingly, just like Mom, Conundrum also had one male and one female. Both were up and nursing well. The sheep pen is getting crowded. It’s quite amusing watching the five different mother ewes run around nickering at their lambs, while the lambs all frolic with each other. 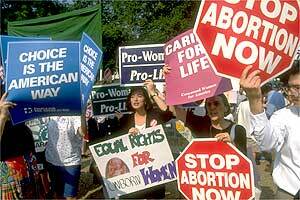 Know that line from the Bible about the sheep knowing the shepherd’s voice? They know their mother’s voice even better. Our fourth ewe delivered this afternoon, and we couldn’t have asked for better weather: sunny, very little wind, and temps in the mid-fifties. Enigma brought us some beautiful twins, one male and one female (on the left and the right, respectively, in this photo). They were already up and nursing when I found them a moment ago. That’s a total of eight lambs thus far (all of which are very healthy), with five ewes remaining to deliver. 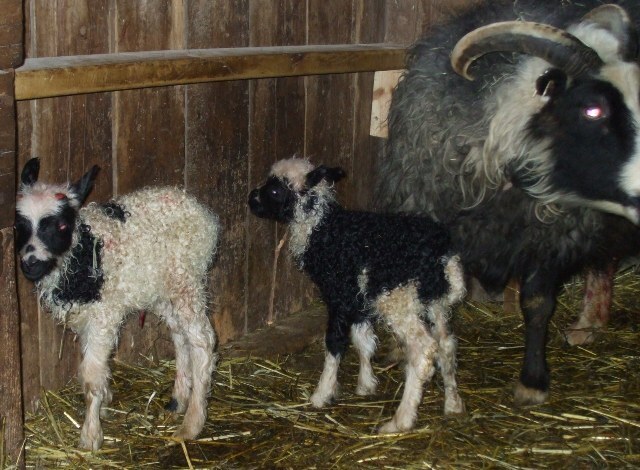 After some initial confusion yesterday, we cleared things up: both lambs are male. That makes a total of six little ram lambs born in three days. Wow! We’re looking forward to lots of good eating next winter. 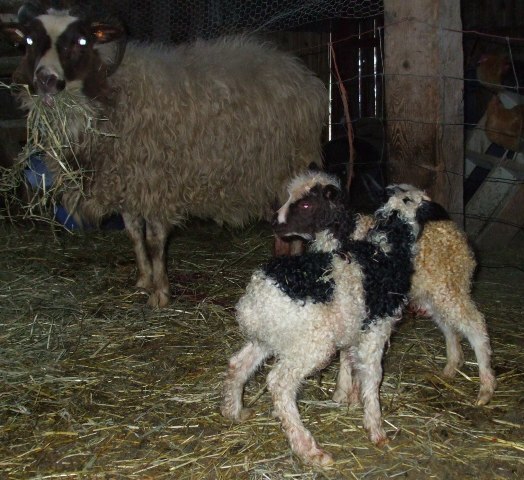 Although she missed by a single day being the first ewe to deliver this year, Maybelle again comes through with a key delivery: beautiful twin male lambs. Her overall record of 200% remains unbroken. 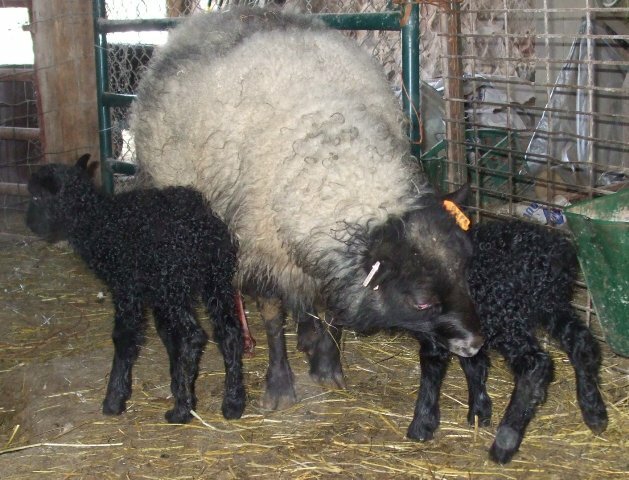 She has given us twins every single year of her breeding life, and they’ve always grown to a nice size (except the first year, when we didn’t know what we were doing, and both lambs died hours after being born). Homeschooled Farm Girl and Little Big Brother had a break from school and watched the first lamb emerge. I don’t know about you, but I would’ve killed for an opportunity to spend my recess doing that when I was in grade school. 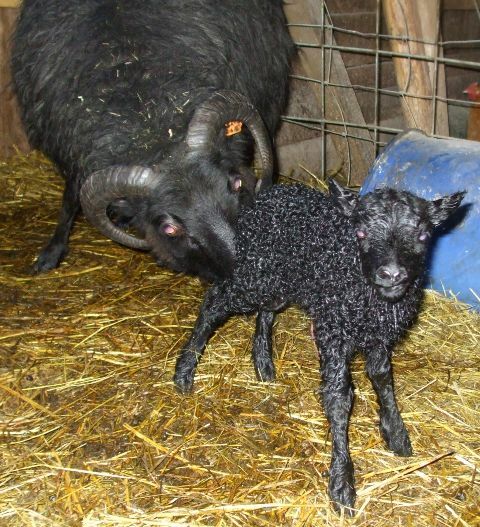 Meanwhile, Licorice’s twin males born yesterday are also doing very well. We’re thankful the nice weather is holding on into the weekend; it sure beats trying to keep these little guys warm in freezing temperatures. The huge white egg is from a goose. 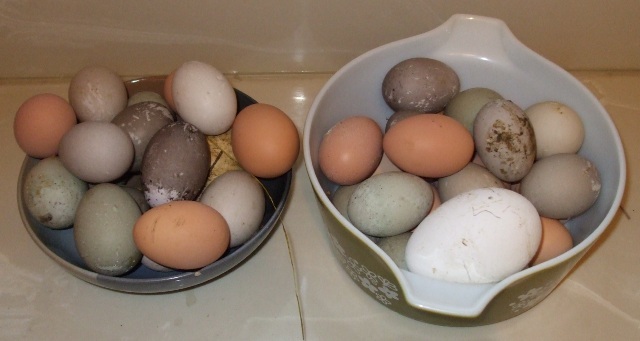 The brown eggs are from our chickens. All the rest — in their varrying shades of green and gray and black — are from our Cayuga ducks. The coloring is a sort of fine film, and can be washed off if you rub it enough. But we think the colors are fun, and don’t do more than wash off the dirt from the barn. How else can you have green eggs and ham? Our Alpha rooster, Sardine, (don’t ask…Little Big Brother came up with the name years ago) was sadly deposed from his position in the Pecking Order a few days ago. 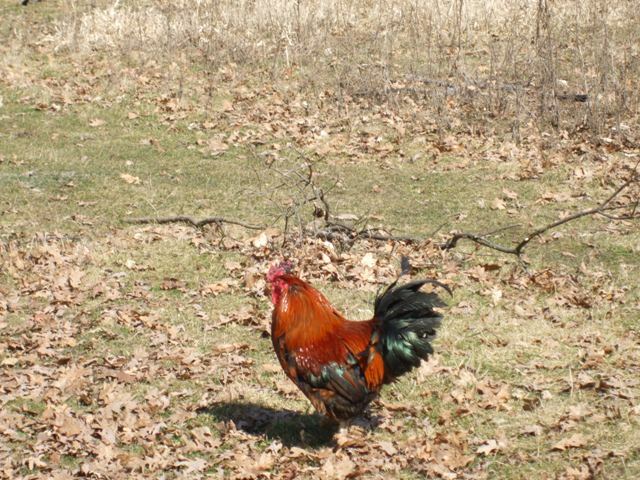 It may have been something about spring, but another rooster got it in his head that he was going to make a run at the big guy. A couple of days of cockfights ensued, and I assumed that Sardine would prevail. Every time I tried putting him back with the other chickens, he ended up back outside…aparently seeking a safe haven. He’s been roosting in another part of the barn ever since. I’m guessing he’s trying to regroup. Now, he’s been spending his days “out standing in the field.” All by himself, out in the huge sheep pasture. Kind of sad. 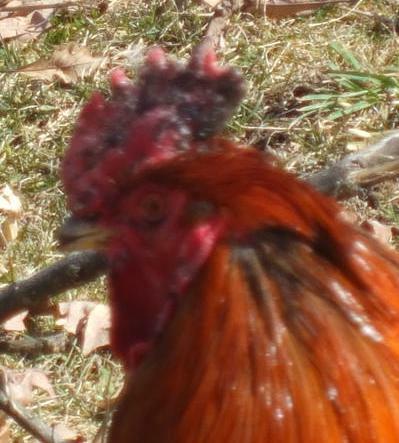 But he’s still an extremely beautiful rooster…and I wouldn’t write him off just yet. 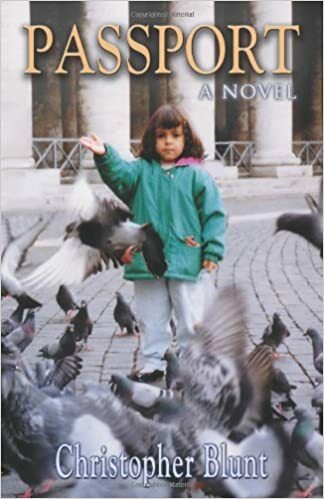 2) Maybelle didn’t deliver them. Licorice did. Our breed of sheep, Icelandics, only come into heat during the cool months of the fall. 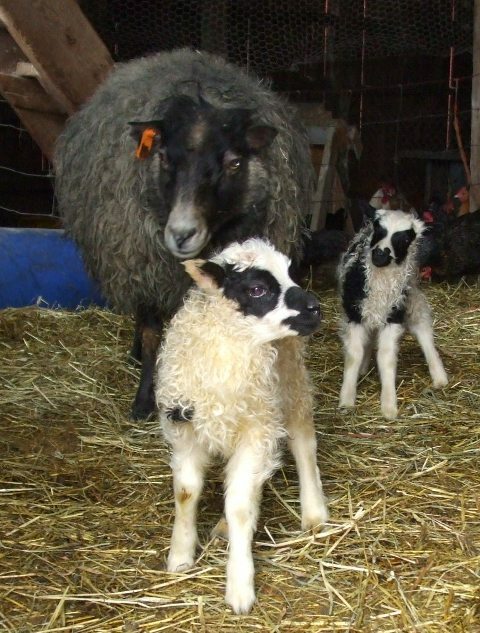 They have a roughly five month gestation, so that means lambs are only born in the spring. Commercial meat breeds have been developed to come into season at all different times of the year, which allows commercial lamb to come to market all year. 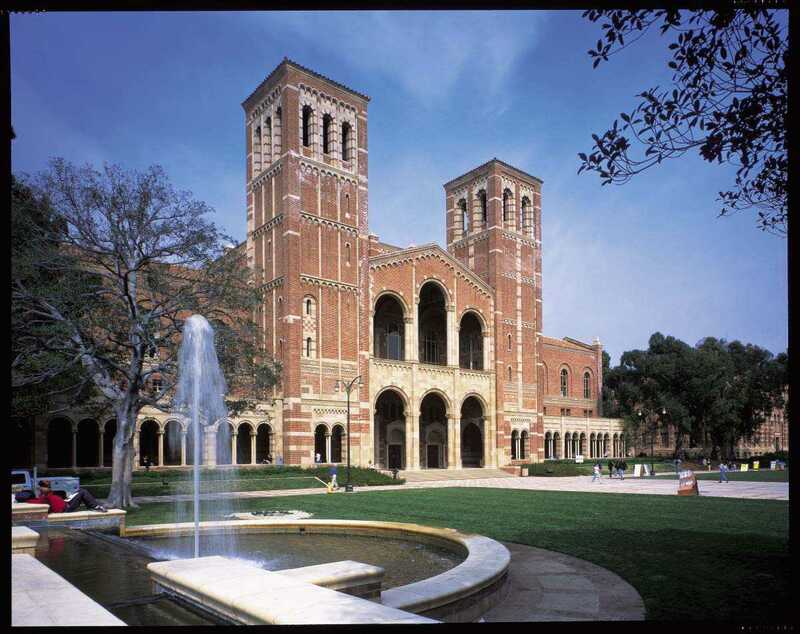 We prefer our heritage breed, which follows the natural flow of the seasons. Anyway, I suspect we got an early lambing this year because last fall was so unusually cool. They must’ve come into heat early. And judging from the enormous size of several of our other ewes, the rest of the spring lamb crop won’t take long to get here. Maybelle has always been our first to lamb, but she’s never delivered before the last few days of March. Most of our lambs are usually born in April. I just hope we don’t get another nasty cold snap right in the middle of the other lambs’ arrivals. Couldn’t have asked for a more perfect day for a lambing today. 55 degrees and sunny. It won’t last, but we’re sure enjoying it while its here. 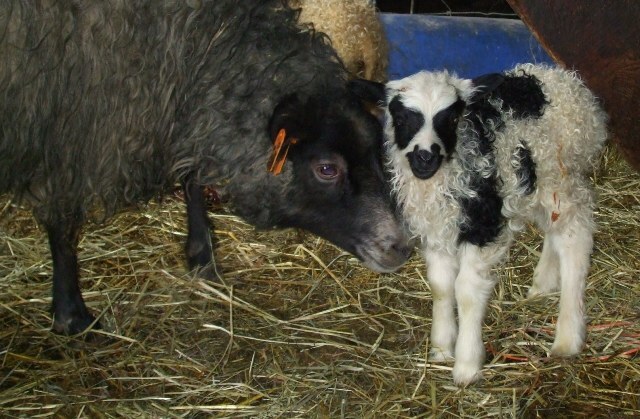 For the record, both lambs born today are males. They’re doing great — up quickly, getting licked off, and one was already trying to nurse. 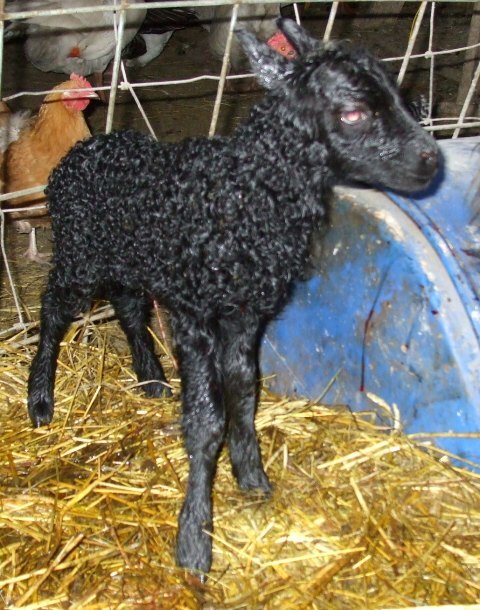 Licorice has been known to triplet; if she does have another surprise for us later, I’ll update this post. One ewe down. Eight more to go.